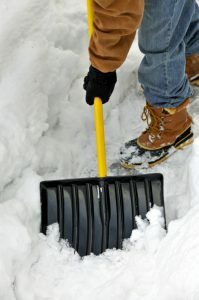 Learn how to remove snow and ice from your property the correct way. We are in the middle of winter, so there is a likely chance that more snow is on the way to Maryland before spring arrives. As a homeowner, snow can be a hassle especially if it is a storm that leaves several inches on your property. Once the snow falls around your home, you want to remove it as quickly as possible especially if it is on your car. Although, you have to conscious on how you remove snow. Luckily, there are a few simple tips you should when removing snow from your property. When removing snow with a shovel and snowblower, you have to be cautious about where you place the snow. When you are using a shovel, make sure you are not placing it on plants and other shrubbery that is already covered in snow. You don’t to further damage your plants causing you to replant them. If you are using a snow blower, it is critical that you are safe at all time. Make sure never to place your hand in front of a blower even if it is turned off. The last thing you want is the tension from the blade causing you to lose a finger. It is common to use salt products to melt snow and ice, although it is has a negative impact on grass and plants. When salt gets on your lawn or plants, it draws water away from their roots causing severe damage. When wanting to melt snow and ice, you should choose a more earth-friendly product such as calcium magnesium acetate (CMA.) It is a biodegradable and non-corrosive, so it will not damage you and your family’s cars. The product is also very safe when it comes to plants and animals. If you find snow or ice stuck on your trees, you want to avoid shaking any branches to remove the snow. The last thing you want to do is to damage your tree any more than it potentially is. You should wait until the snow and ice have melted to fully access the damage. This entry was posted on Friday, January 26th, 2018 at 6:02 pm. Both comments and pings are currently closed.